Pound, Elmer Wayne "Angel," 71, retired U.S. Army, died Thursday, Oct. 22, 1992. Service 2 p.m. Tuesday, Fredonia City Cemetery. Survivors: brother, Don of Martinez, Ga.; sister, Allie Mae Smith of Hominy, Okla. Timmons Funeral Home, Great Bend. 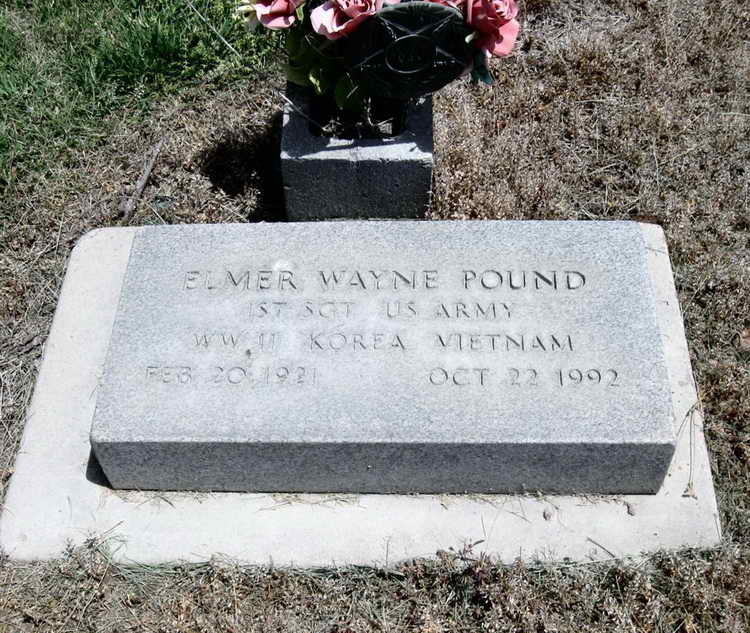 Grave marker for Elmer W. Pound in Section 7, Lot 1691-4 of the Fredonia City Cemetery, Fredonia (Wilson county), Kansas. Elmer enlisted in the Army on 1 October 1942 at Ft Leavenworth, KS. HE was a member of Company A and was awarded the Combat Infantryman Badge for action during the Normandy, France Campaign, 6 June 1944 to 9 July 1944. Based on the headstone inscription, he made the Army his career and retired with the rank of First Sergeant.